When last we Drunkspun, we were so angry at Stella Artois for sucking that we completely overlooked the fact that we don't even need the good Belgian beer around anymore. We were so busy praising all the good Belgian beer, lest we look ugly and ungracious by failing to properly appreciate their centuries of meritorious service to the drinking arts, that it totally slipped our minds that so many high-class American outfits have successfully ripped off Belgian styles that we can just forget about the motherland altogether. Woo hoo! Allagash, in original Portland, makes my favorite Belgian-inspired American beers. Their White is one of the world's best witbiers, their Curieux is my family's official celebration beer, and Allagash Hugh Malone might be my very favorite beer of any style. Problem is, Allagash White is Peter King's favorite beer, Curieux costs $20 a bottle, and Hugh Malone costs $20 a bottle and is only released once a year and starts to degrade pretty significantly two months after it's bottled, so even if you were a millionaire with $60 to spare, you couldn't really stock up. So, screw Allagash. I love it, but I can't afford it. Whereas Ommegang, in Cooperstown, N.Y., is America's most user-friendly Belgian-style brewery. I'm not sure the head of its class rivals Allagash's best, but you can get most of their 750-mL bottles for less than $10, which means they're a pretty good deal, pound for pound and pennies for ounce. One huge strike against Ommegang, though, is that they make the Game of Thrones beer. The new one's called Valar Morghulis, which apparently means "All men must die" in some make-believe nerd language. Oh, man, would that make for a good clickbait headline. I could write about that one, get a billion page views, be named executive editor of Gawker Media, and fire all the people who like the wrong kinds of cereal and superheroes, but alas, I must resist. You see, I do not like Game of Thrones, and would therefore bring an unfair bias to the review, which would not be a properly ethical way to approach nerd-beer journalism. So Ommegang Three Philosophers it is. This is an interesting one: a gigantic 9.7-percent alcohol-by-volume quadrupel cut with two percent of Liefmans Kriek, an oud bruin (sour brown ale) fermented with cherries. Quadrupels tend to be big, old, nasty, boozy things, so it makes sense to lighten the whole deal up with a small dose of something more refreshing, but I'm generally suspicious of hybrid beers. It's hard to make a good donut and hard to make a good beer, so what are the odds that anyone can make a good beer that tastes like a good donut, you know? But this cherry-quad gambit seems less gimmicky than a lot of combo beers, so I dropped $9 on a big bottle to see what I could see. 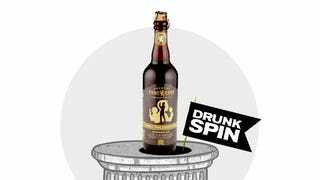 Ommegang Three Philosophers pours a deep reddish brown and has a very strong chocolate-cherry aroma. The dark-caramel-malt smell eventually wins out, but the cherry is more prominent than I'd have guessed, given that only two percent of the blend has actual fruit in it (I'd have believed 20 percent). It's very good beer, with honey and brown sugar followed by distinct waves of cherries and grapes. The slightly sour edge from the kriek perfectly balances the sweet chocolate, fruity essence. Ommegang Three Philosophers is pretty damn good by any measure, and a downright gem for the price.